Alabama's Nick Saban speaks to an official during the Crimson Tide's season-opening win against Florida State this past Saturday night. On Wednesday, Saban said coaching has never been about the money for him. Alabama football coach Nick Saban is making $11.15 million this season as a result of the raise and contract extension that was approved by the university's board of trustees in May. After the Crimson Tide's two-hour practice in full pads Wednesday afternoon, Saban was asked in a news conference if he was worth it. "Probably not, but I don't really do this for money, and I never really have," he said. "I started out in this profession making $8,000 a year, and that was after two years as a graduate assistant making nothing. I was going to graduate school and loading trucks at night, and my wife worked in the registrar's office, and we were happy when my dad brought us a case of peas so we could have a side dish. "We worked hard through the years, and I don't think it's up to me to determine what the value or market is for coaches." Saban was hired at Alabama in 2007 and went through a 7-6 debut season that included an upset loss to Louisiana-Monroe and the program's sixth consecutive defeat against rival Auburn. He has since gone 113-13 with five Southeastern Conference championships and four national titles. Alabama is No. 1 this season, having opened with a 24-7 win over No. 3 Florida State last Saturday night. The Crimson Tide have been No. 1 at some point for 10 consecutive years. In 2013, Forbes magazine reported the school's enrollment went up 33 percent in Saban's first six seasons, which included national championships in 2009, 2011 and 2012. Crimson Tide receivers coach Mike Locksley will work Saturday's game against Fresno State. Locksley's son, Meiko, was shot and killed last Sunday night in Maryland. "I told him that he certainly wasn't expected to be here and that he could spend as much time as he needed with his family," Saban said. "He said it's helpful for him to be here to get his mind off of things." Locksley was Maryland's offensive coordinator from 2012 to '15 and served as the interim head coach of the Terrapins for the final six games of his last season with the program. He came to Tuscaloosa last year and worked as an offensive analyst. 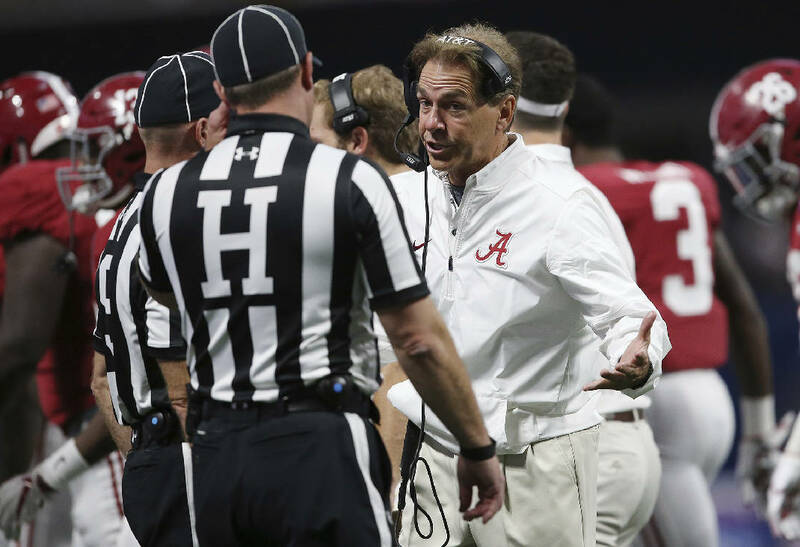 Alabama received a sideline warning during its win over Florida State at Atlanta's Mercedes-Benz Stadium, and on Wednesday, Saban explained how it occurred. "When the play would be over, our players would actually move toward the field too quickly because we substitute a lot on offense and defense," he said. "It's something we had to work on, because when you're going fast, as soon as the next play comes, we call something out, and guys want to get out there on the field. "Sometimes they were getting out there a little bit too fast, so we just had to get that cleaned up." Saban said linebackers Rashaan Evans and Anfernee Jennings are not likely to play Saturday and will be "day to day as we go here in the next week or so." ... It was confirmed this week that Alabama and Miami will play in a Chick-fil-A Kickoff Game in 2021.